Budget exemptions were finalized at the Student Government Association (SGA) meeting Tuesday evening. 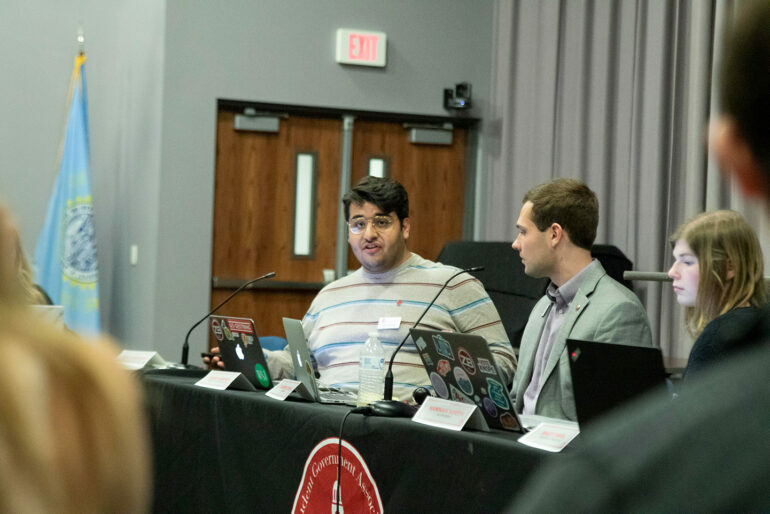 Food limit waiver and clothing exemptions took up a large chunk of the meeting, as senators voted on each student organization’s request for exemptions, though they shouldn’t have. According to meeting minutes from Nov. 28, 2017, when the bill limiting the amount of money organizations could request for food was being proposed, there was a motion made by former Sen. Marcus Ireland to strike Senate from the voting process and add the budget or finance committee. The amendment was approved by a voice vote. This made it so the budget or finance committees were in charge of voting on food exemptions, instead of Senate as a whole. However, the amendment was never added to the bylaws. As a result, Senate should not have voted on food exemptions. Senate did vote on the food limit waivers acknowledged by student organizations that wished to request more than 20 percent of their budget for food. Many of the organizations were culturally centered and therefore food was recognized by SGA as being at the core of the organization’s mission. The only organization denied of this request was the Association of Computing Machinery. Sophia Lima, director of finances, stated the organization only had 10 members and were requesting pizza money on a monthly basis for recruiting purposes. The request was denied by a voice vote. Clothing exemptions were also addressed on a case-by-case basis, with the precedent being the organization needed clothing for organizational purposes and not as gifts. Many members of Senate voted with the precedent that if members are able to keep clothing after its organizational purpose, it is still a gift and cannot be funded. Under SGA’s fiscal guidelines, there is no definition for awards, gifts, scholarships or prizes, but SGA funds cannot be used to reimburse or purchase them. Several organizations with some including CAB, Dakota Days, and Dakotathon were denied funding for clothing. Sen. Sidney Juffer said it’s important for organizations to understand SGA’s fiscal guidelines before asking for these budget allocations. “We need to make sure that we are utilizing the money to affect the most students, and I don’t think a gift is the right way to market your organization,” Juffer said. Juffer said she’d like to see organizations to be invited to the meeting discussing these exemptions so they are able to give a detailed justification. Dakotathon also had a separate apparel exemption request for this year was voted down at the meeting for the same reasoning as the 2020 request that shirts provided to members for the event would be a gift, as the shirts would not be returned. The International Club was also granted large organization status by suspending the bylaws. Anita Shrestha, president of International Club, said she didn’t petition at an earlier meeting to qualify as a large organization as she came to the meeting but misunderstood if they were discussing large organization petitions and then left. By a 17-7 vote, International Club was granted large organization and given until Wednesday at 2 p.m. to submit a large organization budget request by a vote of 19-5. Shrestha said she was glad her club was given the opportunity to be a large organization again. Also passed by a 23-0-1 vote was a resolution sponsored by Sen. Amber Hulse to provide feminine hygiene products in the MUC bathrooms at no cost to students. Hulse said this resolution shows that SGA is passing legislation to aid students. “I know we get a bad rep for not ever doing anything productive for students and I think this is a sign of senators really responding to their constituents and doing something that students need, that matter and that they use every day,” she said. The dispensers, funded completely by SGA, will be ordered sometime this week and delivered in May. Hulse said she is hoping they will be installed by the fall or even as early as this summer.